Having a little baby sure doesn't leave a lot of time for blogging! I have been thinking about you guys, though. Thanks for all the lovely comments on the new toy! I really love them too, and can't wait to share the pattern. I'll be deciding this weekend how to organize the test knitting, and hopefully I can get the pattern all ready for you by mid-March. I think Spring solstice would be a fitting date for the pattern release. I've also been thinking about putting together some more kits. In light of the difficult economic times that are affecting a lot of people, I'm thinking of making some less expensive kits. What would you think of kits with a tote bag or zip pouch, a single pattern, and yarn for the pattern? I'm not quite sure of the cost right now, because it depends on the cost of the materials for the bags. I will probably redesign them to use less fabric, but they will still be sturdy and well-made, as before. I was thinking it would be fun to make up a bunch for the new pattern. I would include a bunch of fun yarns for one raggedy toy, which you could use all up for one toy, or put together with your own yarn to make 2 or 3 toys. Please let me know what you think in the comments, so I can start planning what to do next week! I'm glad everyone likes the bunny! I really love the new design too, so much that I'm nearly done a third toy! I had a great idea for a third animal in the middle of the night (breastfeeding seems to be good for my creativity) so if they all work out, the final pattern will have instructions for a bunny, a puppy, and a lion! All made with simple changes to the basic pattern. However, there hasn't been much time for knitting around here the last few days, because Lev got his first round of vaccinations on Tuesday. He hasn't had any bad reactions, like a fever, but his sleep has been really disrupted and he just wants to be held most of the time. Hopefully he begins to feel better today. I also meant to say thanks for everyone's suggestions for dairy-substitutes. I tried the almond milk, which was nice but expensive! The oat-milk sounded interesting, and I did find some, but I'm allergic to oats so I didn't try it (I have some weird food allergies). I also saw hemp-milk, but didn't try it. It was as expensive as the almond milk, and I had this funny idea that it would taste strange, like pumpkin seeds (I have no idea why). Lev seems to be okay with soy for now, so I've been drinking small amounts of that again. I long for cheese and yogurt, though, and the next few weeks of waiting will be hard. I just hope that Lev's digestive system is much improved by 3 months. So, while I was knitting my noro socks, I got thinking to myself, what is it about this yarn that makes it so popular? Or even, what is it about the cute Japanese designs I've seen all over the blogosphere that people love so much? Then, how can I use these design elements in a new toy, that's different from the style of my previous toys? Big questions to answer, and I didn't answer them fully, but I thought of a couple of things what would be useful to me. What I really like about the Noro Kureyon yarn is the combination of texture and the almost random selection of colour. Somehow the most unlikely colours would look good next to each other, just because the whole sock was so lovely overall. That got me to thinking about the tub-full of left-over yarn I have from all the toys I've made. Most toys take less that a 50g ball, but there usually isn't enough left over for another toy. All those partial balls have been piling up for the last 2 years! Then I thought, if I'm making a toy from scraps of yarn, maybe it should look like a doll made from scraps of fabric, that is, a rag-doll. So I drew a quick sketch, giving the toy longer arms, legs, and body so it would look different from my other bunnies. I also decided to reshape all the pieces. I made the arms and legs attach in a way that would make them floppy. I redistributed the shaping on the body, and gave it a flat bum so it would sit better. The head got bigger cheeks, and the shaping of the ears is a little different. The first prototype I decided to make in neutral tones to keep it simpler, and because I had yarns in some great textures that I wanted to use. It took me a few weeks to finish him, which is mostly due to Lev keeping me busy, rather than the design being difficult to work out. In fact, pretty much every part turned out just how I wanted on the first try! So here he is, as yet without a name. I think he turned out pretty darn cute! Next up is to make a puppy from the same design, since I think it would just be a matter of slightly different nose and ears. Then both would be available in the same pattern. One of my hobbies is doing English subtitles for Russian cartoons ("fansubs"). It's kind of fun and challenging, especially if I get to translate songs or poems. Here is a cheesy Russian cartoon I translated last weekend -- in fact, it is pretty much how Lёva got his name ("Lev" is "Lion" in Russian). I meant to post more last week, but got sidetracked with all the millions of things that needed doing, which weren't blogging. I finished my noro socks, and will try to get a picture soon to show you how pretty they are! I haven't stopped wearing them since I washed them, but I should give them a little break soon. Anyway, to start your morning off with some cuteness, here are some videos of Lev we took recently. The first was taken during his bath (carefully edited to preserve his dignity) and you can see how chubby he's become in the last few weeks. He's 10 lbs now, which is pretty respectable for an 8 week old baby. It's even more impressive if you know that's double his birth weight! This second video was taken just before my mom left, and it's showing the first time he rolled over. Can you believe it, at just 7 weeks? He's done it a bunch of times since then, so it wasn't just an accident. He keeps trying to roll from his back to his front too, but isn't quite strong enough to manage that yet. 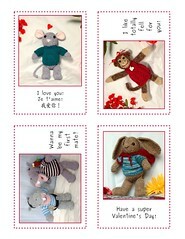 This is just a very quick note to tell you about these Valentine's cards Mr. Mitten and I made today. I hope you and your kids have fun giving them to all your friends and family! Click on the image to get to the flickr page, and then click on "all sizes" to get to the original high-resolution image. Alternatively, if you want an even better quality image, download the pdf (but it's a pretty big file). Print them on some nice heavy paper, cut out, and write a note on the back.